In the two previous chapters we dealt with several examples of the striking out of patterns for circular pipe joints, we now extend the methods there shown to the cases of bends made up in segments. Fig. 16, the segments, and a semicircle described on it as shown, this being divided into six equal parts, and perpendiculars dropped on to the mid-line. For the pattern, a girth line is laid out equal in length to the circumference of the pipe, this being divided into twelve equal parts, and perpendiculars run up through each division point as shown. The compasses are now set respectively to the lengths of the perpendiculars between the mid-line and joint line and these transferred to the similarly numbered line on the pattern, and marked off both above and below the girth line. In each case these construction lines will be a shade too long, as will be seen by reference to the figure. To take one line only; instead of using the perpendicular 5' 5' for the pattern line, the length of the arc 5' 5" should have been used, and so with all the others. But manifestly the difference in length between the straight line and the arc is so small, that in nearly all practical work it is hardly worth taking into account. In all cases where there is no intention of working the segment into shape, by hollowing the back and stretching the throat, the straight line should be used. The methods of fastening the segments together are various. They can be simply slipped over and soldered, either with or without sinking the seam, riveted together by having the segments alternately inside and outside, paned down or knocked up. The allowances on the pattern are shown for the latter two methods. 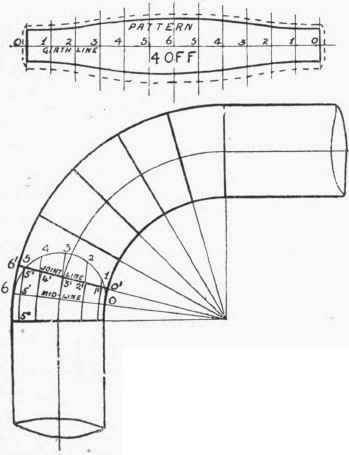 If the segments are to be put together with one inside, the next outside, etc., then it will be necessary to take the thickness of the sheet metal into account, and have two patterns, the outside one being about seven times the thickness of the metal longer than the inside segment, as explained in Chapter XXXII (Plater'S Work, Tanks, Shells, Etc. Allowance For Metal Thickness). In shaping the strips for small pipes, the usual plan is to hollow up the back part of the segment before bending the ends of the strip around to form the throat. Haying hollowed the back part, the ends are then bent around, grooved or riveted up, and stretched to the required shape. The kind of jointing and quality of work on the bend will, of course, depend upon what it is to be used for. Large pipe bends that are made out of boiler-plates are constructed in a somewhat different fashion, the plates being arranged so as to break the joints. A sample of this kind of work is shown in Chapter XXXIII (Plater'S Double-Curvature Work).